NEW YORK - Two of the world's greatest superheroes have been arrested by police for allegedly getting into a brawl with a man in New York City, reports CBS New York. The NYPD told the station two men - one dressed as Batman and another dressed as Spider-Man - were arrested Saturday night for getting into a fight with another man in Times Square. Police said the fight started on 44th Street and Broadway after Thomas Rorke, 23, heckled the men portraying the costumed characters. Jose Martinez, 41, who was dressed as Batman and 35-year-old Abdel Elkahezai, who was dressed as Spider-Man, were all charged along with Rorke with misdemeanor assault, the station reports. Rorke, a Queens resident, was struck multiple times in the face by the comic book heroes, according to authorities. He sustained injuries to his face and was also hit in the chest. Martinez and Elkahezai said they were also punched in the incident. 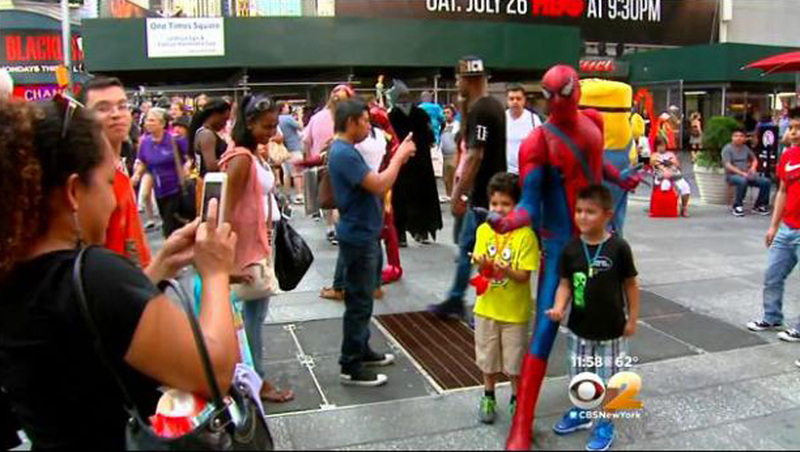 CBS New York reports city officials have been mulling a crackdown on costumed characters in Times Square following numerous incidents of bad behavior in recent months. The station even interviewed Martinez about the issue back in July. City Councilman Andy King is sponsoring legislation that would require costumed characters to obtain a city license. "We're saying if you do come out here [to Times Square], we want to know who you are," he said, according to the station. Tourists and New Yorkers told the station they support the idea. "In London, any sort of street entertainer has to be licensed," said tourist Andy Hawkins. Some of the costumed characters have long rap sheets, including Elkahezai, the brawling Batman from Saturday night. Police said he had previously been arrested for public urination, assault and weapons possession.